How Russian Twitter Bots Pumped Out Fake News During The 2016 Election : All Tech Considered Clint Watts, a former FBI agent, describes a diffuse network of Russian hackers and propagandists conducting a misinformation campaign that didn't stop with the election of President Trump. 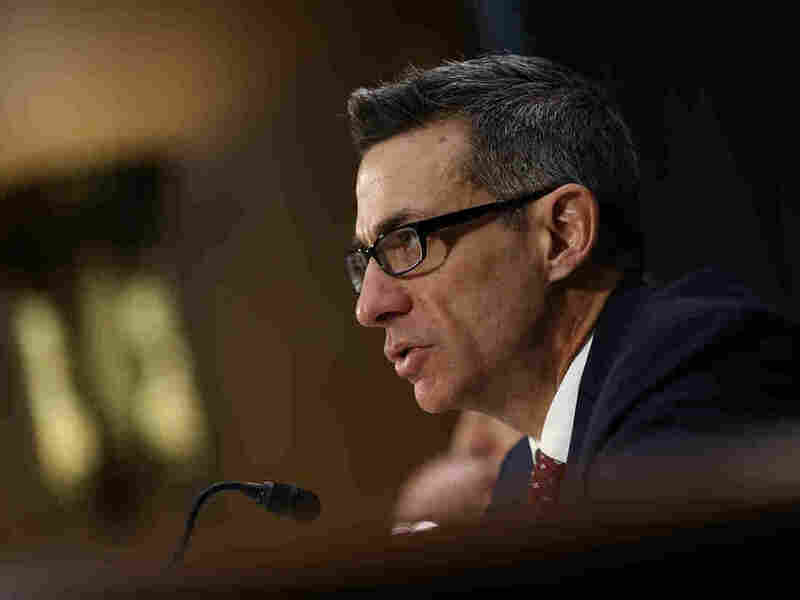 Former FBI agent Clint Watts testifies before the Senate Intelligence Committee on Thursday in Washington, D.C. When he testified before the Senate Intelligence Committee last week, former FBI agent Clint Watts described how Russians used armies of Twitter bots to spread fake news using accounts that seem to be Midwestern swing-voter Republicans. "So that way whenever you're trying to socially engineer them and convince them that the information is true, it's much more simple because you see somebody and they look exactly like you, even down to the pictures," Watts told the panel, which is investigating Russia's role in interfering in the U.S. elections. In an interview Monday with NPR's Kelly McEvers, Watts, a senior fellow at the Foreign Policy Research Institute, says the Russian misinformation campaign didn't stop with the election of President Trump. "If you went online today, you could see these accounts — either bots or actual personas somewhere — that are trying to connect with the administration. They might broadcast stories and then follow up with another tweet that tries to gain the president's attention, or they'll try and answer the tweets that the president puts out," Watts says. Watts, a cybersecurity expert, says he's been tracking this sort of activity by the Russians for more than three years. "It's a circular system. Sometimes the propaganda outlets themselves will put out false or manipulated stories. Other times, the president will go with a conspiracy." One example, he says, is Trump's claim that he was wiretapped at Trump Tower by the Obama administration. "When they do that, they'll then respond to the wiretapping claim with further conspiracy theories about that claim and that just amplifies the message in the ecosystem," Watts says. "Every time a conspiracy is floated from the administration, it provides every outlet around the world, in fact, an opportunity to amplify that conspiracy and to add more manipulated truths or falsehoods onto it." Watts says the effort is being conducted by a "very diffuse network." It involves competing efforts "even amongst hackers between different parts of Russian intelligence and propagandists — all with general guidelines about what to pursue, but doing it at different times and paces and rhythms." The White House has blamed Democrats for the allegations of Russian interference in the U.S. election, saying the theory is a way to shift the blame for their election loss. But Watts says "it's way bigger" than that. "What was being done by nation-states in the social media influence landscape was so much more significant than the other things that were being talked about," including the Islamic State's use of social media to recruit followers, he says. Gabe O'Connor is a production assistant with All Things Considered. You can follow him @Galacticmule.